China's largest drone-maker DJI Technology Co will strengthen its fight against corrupt practices and rumor spreading, and called for local governments and enterprises to build an integrity database of employees in key positions of responsibility, the company said in an open letter on Wednesday. Some former DJI employees tried to vindicate themselves and spread rumors both inside and outside the company, such as accusing the anti-corruption investigators within the company as forming cliques, the letter said. "The investigation and evidence collection of corrupt practices are very hard," it said, "even if behavior, credit losses or corruption are found, few of those people will lose their jobs; some employees published anonymous articles online which have resulted in negative pressures from adverse public opinion. These are all issues that DJI is currently experiencing." 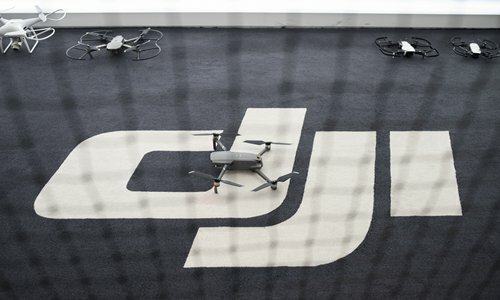 DJI has established an internal investigation task force to look into corrupt practices that caused the company to lose about 1 billion yuan ($150 million), according to a memo obtained by the Global Times. A total of 45 employees were found to have been involved in corruption and/or misconduct, most of whom held positions within the supply chain, the memo said. Of these, 16 were handed over to police and the other 29 were dismissed immediately. However, corrupt employees stayed in cahoots with some of the company's suppliers, the letter said. "Some suppliers would rather lose the orders from the company rather than cooperate with the company in the fight against corruption. Instead, they sent letters of reference for the corrupt and fired employees to other companies," it noted. From the very beginning of the supply chain, material purchases, semi-processed products to the finished product, the corruption practice led to increases in procurement costs of 5 percent to 10 percent, at each step in the supply chain. Hence, the cost of finished products then rose 16-33 percent after the three steps from the industrial chain through to the purchasing companies, DJI said. The corruption has resulted in a huge hidden additional cost for the company, which clearly hinders the development of China's technology manufacturing industry and even China's innovation. On January 16, the founder of DJI, Jiang Tao, submitted a proposal to build an integrity records database for people in high risk positions, to the sixth Session of the fifth Committee of the Chinese People's Political Consultative Conference of Shenzhen, the letter said. He called for joint work between local governments and companies to eliminate corruption and form a healthy environment of "paying high for honest employees" at companies.